This is a modification for NW that changes Austria to the Mexico. 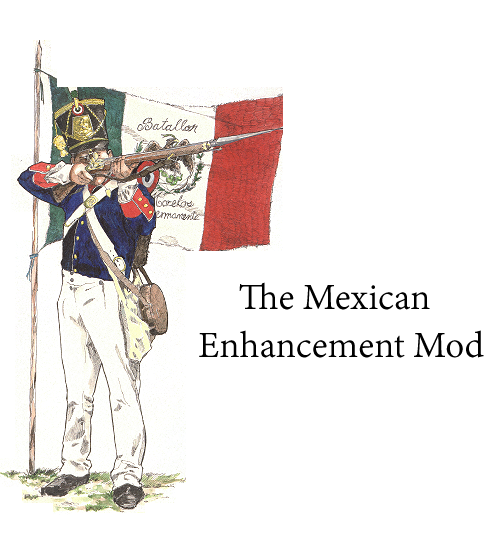 Everything will be changed to match Mexico's army during the 1800s. Re: Mexican Enhancment mod GIVING AWAY THE FILES!!! wow you're a genius I could do some uniforms for a mod of South America that are working? Im mostly aiming for mexico, but other south american nations will be great also! Nice job! What about aiming animation? (download or something) Because it look good. The animations are not done by me so sorry. This was mainly an attempt by me to overhaul the Austrian faction. I even tried doing some sound replacement (which failed badly). I decided to give this out to the community if they want to develop the mod for themselves or maybe make their own mods with the resources I made.